James Hardy Wilkinson (27 September 1919 – 5 October 1986) was a prominent figure in the field of numerical analysis, a field at the boundary of applied mathematics and computer science particularly useful to physics and engineering. 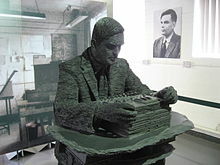 He worked with Alan Turing at the National Physical Laboratory in the early days of the development of electronic computers (1946–1948). Turing had a strong predeliction for working things out from first principles, usually in the first instance without consulting any previous work on the subject, and no doubt it was this habit which gave his work that characteristically original flavor. Of course everything in computerology is new; that is at once its attraction, and its weakness. He [Turing] was particularly fond of little programming tricks (some people would say that he was too fond of them to be a "good" programmer) and would chuckle with boyish good humor at any little tricks I may have used. Numerical analysis has begun to look a little square in the computer science setting, and numerical analysts are beginning to show signs of losing faith in themselves. Their sense of isolation is accentuated by the present trend towards abstraction in mathematics departments which makes for an uneasy relationship. How different things might have been if the computer revolution had taken place in the 19th century! [...] In any case "numerical analysts" may be likened to "The Establishment" in computer science and in all spheres it is fashionable to diagnose "rigor morris" in the Establishment. Of course everything in computerology is new; that is at once its attraction, and its weakness. Only recently I learned that computers are revolutionizing astrology. Horoscopes by computer!